What’s the Difference Between Being a Good Citizen and Being a Snitch? Nobody likes a snitch, but snitches rarely think they’re snitches. Are you reporting to your boss whenever someone takes off early on a Friday, or are you turning in the jerk who stole all the Christmas donations? There’s a difference, but this doesn’t mean that doing the right thing, or knowing when to mind your own biz, is as obvious as it seems for the rest of us. This month at the “Ethicist” column at the New York Times, Kwame Anthony Appiah advises a reader who watched three friends cheat on a middle school test and wonders if he should’ve told. The test was graded on a curve, meaning the cheating students also cheated other students out of better grades, and the three cheaters would also go on, unfairly, to prestigious high schools. Appiah acknowledged that cheating, of course, is wrong. But surprisingly, he advised the writer not to rat out his three friends. His reasoning: Cheaters gonna cheat; they may or may not get theirs some day. Whistleblowing, however, isn’t always worth the retaliation that often follows it, and while the tattler may be right to tell, he’s almost certainly now three friends short. No easy calculation. For what it’s worth, many readers disagreed and thought he should’ve simply reported the cheaters anonymously. Such solutions demonstrate the complexity behind seemingly simple ethical conundrums. Is it worth it to snitch? Compare this with the recent story of Matt Lauer, whom NBC fired in the wake of his harassment scandal. The network fired Lauer because of ethically reported, valid complaints. But in response, NBC began requiring employees to report knowledge of any inappropriate romantic relationships between coworkers or else risk being fired, essentially making snitching mandatory. 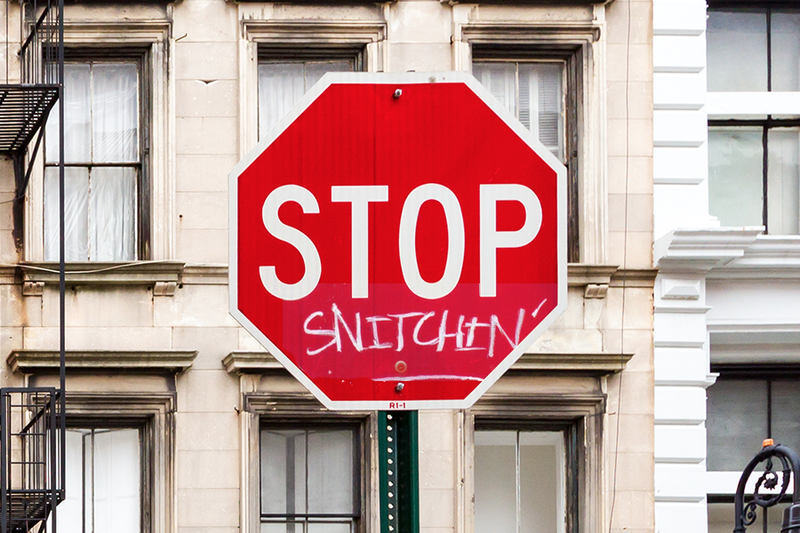 Snitching helped get a bad guy out — definitely worth it. But proof that no good deed goes unpunished, now everyone has to be a snitch to keep their paycheck. “Every office or shop floor has at least one,” begins a post on the office tattle tale at Wharton’s School of Business blog. “The worker watching from the corner of his or her eye, taking mental notes and reporting back to the boss. The office snitch is a reliable recurring character in many workplaces, a petty villain who foments gossip and undermines teamwork and morale.” In one survey, 44 percent of workers identified tattling on a coworker as the one of the most childish behaviors observed in the workplace. What’s more, it damages the workplace. “It can impact morale and productivity, and teamwork goes down obviously because people start to not trust each other and they start cocooning,” HR director Linda Willey told Wharton. In trying to identify this kind of snitch, look for some shared common traits: It’s often someone whose job responsibilities have been reduced; someone who is jealous or disrespectful of their colleagues; someone who hangs out a lot in common areas where they can pick up a lot of intel on coworkers; someone who fawns over management; and someone who puts in a lot of office time. They admitted to reporting these observations to higher-ups 67 percent of the time. And researchers theorize that because they report more unethical behavior, they’re more likely to believe they’ve been retaliated against. To be clear, it’s one thing to rat out someone for taking a long lunch; quite another to blow the whistle on harassment, fraud, hostile work environments and the like. Snitches snitch for no other reason than to curry favor with the higher-ups and advance their own career. Whistleblowers expose egregious, illegal cover-ups that, regardless of the tattler’s true motive (pure noble cause versus, say, sticking it to the liars in accounting), were harmful practices to workers and workplaces and the community or the world. But what about everything in between? Bigger than a two-hour lunch; smaller than poisoning the water supply. Back at the Wharton post, they offer some practical guidelines to consider before taking issues up the flagpole: Make sure what you’re reporting is, in fact, true, and not speculation. Accept that once you file that complaint, the process after the fact may be entirely out of your hands—people may be fired (or not); careers may be ruined (or not). Consider that the lower you are on the totem pole, the more likely you’ll be punished for tattling, even if you’re in the right, and even though it’s illegal to do so. Even anonymous reporting can backfire. But therein lies the rub: While most people will truly, seriously weigh a complaint and try to address it with the person in question before taking it up with management, a true snitch isn’t going to ask him or herself any questions about the accuracy or relevance of the snitch, much less admit to themselves they’re holding a grudge. Besides, they’re already giving the boss an earful.